After the break in testing SCSI drives we are starting a new series of tests. But don't judge me strictly as this is my first experience as a writer. 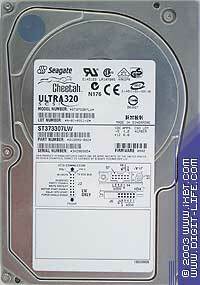 So, today we have two similar hard drives - Seagate Cheetah 10K.6 ST373307LW (firmware 0002) and Fujitsu MAP3735NC. 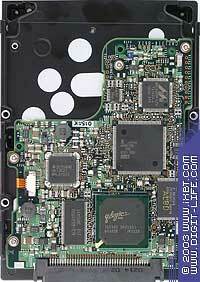 Seagate has its 6th generation of 10K SCSI drives, which is indicated in its name (10K.6). The company maintains that the latest generation has its speed higher by 25% and the access time lower by 10% as compared with the previous generation. The drive supports 3D Defense Shield Technology, but no new technologies are mentioned. Fujitsu's drive is in a similar situation. The company mentions that the average access time is reduced to 4.5 ms, and the track-to-track search time to 0.3 ms, which runs into 25% increase in speed in comparison with the previous generation. No new technologies are used either. 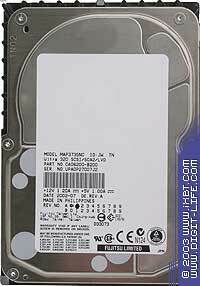 It makes me think that the drive makers are currently exhausted of revolutionary technologies, and both drives are merely evolutionary solutions. The drives look completely identical. Only the access time differ. Well, let's see what results will be demonstrated in the tests. The test system configuration is standard. SCSI adapter - Adaptec 39320D (BIOS ver. 4.00.0 driver ver. 1.0.0.0) in the fifth PCI slot (first PCI64 slot). Simply twins. Though the Fujitsu is a little bit ahead. This is the Seagate's diagram of linear reading. Below you can see it for the Fujitsu. The Fujitsu is again a bit faster. But the average access time test clearly demonstrates advantage of the Seagate, though the Fujitsu has the specified access time better by 0.2 ms. In the WinMark the Fujitsu takes the lead again. In most cases it outscores its competitor by 10%, and the advantage makes 15% for the NTFS. The Seagate has rather queer results. We ran the test at five different loads (linear: queue = 1, very light: queue = 4, light: queue = 16, moderate: queue = 64, high: queue = 256). The performance didn't grow when the load changed from light to moderate. The additional tests at queue = 32 and queue = 128 (previous and next values for moderate) stumped us even more. It turned out that before queue = 32 the data rate was rapidly growing, at 64 it fell in all patterns, and then resumed its growth. The drop in speed from queue = 32 to queue = 64 remains the most mystical. 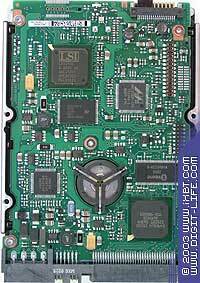 Remember that we used Adaptec 39320D SCSI adapter, driver v1.0.0.0, in the register in the key HKEY_LOCAL_MACHINE\System\CurrentControlSet\Services\adpu320\Parameters\Device\ in the DriveParameter the queue is set to 64 (/MAXTAGS = 64). In the WinBench and HDTach the Fujitsu's drive marginally outscores the Seagate's solution (within the inaccuracy of the measurement in some tests). In the synthetic tests of IOMeter the drives behave equally before the queue length equal to 32, then the Seagate Cheetah shows pretty strange results. But in spite of such a drop at queue = 64, this model outdoes the Fujitsu at the queues longer than 64, as well as in the random writing. But the driver for Adaptec 39320Dnext adapter was recently updated (ver. 1.1.0.0), and next time we will examine behavior of the tandem of Seagate Cheetah 10K.6 - Adaptec 39320D for different driver versions. That is why before the tests the final verdict for these drives won't be announced.